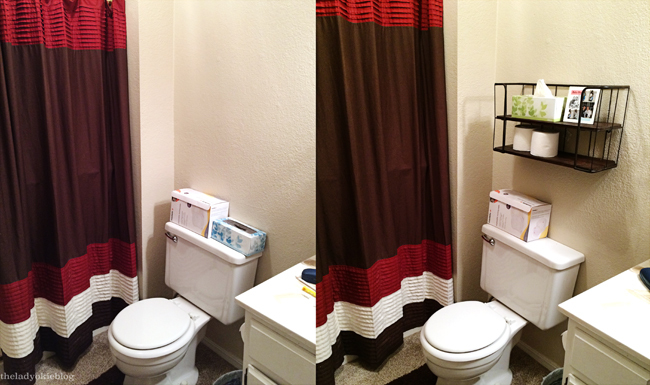 Remember when I shared my Pinterest-inspired bathroom baskets? Well, I figured you were all on pins and needles wondering if I ever found something to put above the toilet in our "master" bathroom. I'm using the air quotes because you probably wouldn't consider this a master bathroom by any stretch of the imagination. It has a toilet, a sink, and a shower head but no tub. Basically it's nothing to write home about, but when we were house shopping, Jordan and I both decided that giant bathrooms are a waste of space, and we would rather spend our square footage on other rooms. Mostly because I hate baths and have no need for a huge jacuzzi. Anyway. The empty space above the toilet looked sad, and after considering a few different options, I did find something to hang there and wanted to share! *Excuse my giant box of breast pads. Nursing mom problems. Should I get adventurous and hang a picture frame above or below it? Or do you think it's good as is? I'm so bad at decorating, you guys. It gives me all the anxiety. Question: Are you interested in seeing more of my little projects? If you like them, I'll keep sharing; if not, I'd rather not waste your time! *I tried to hang this myself and ended up being dumb and putting a giant hole in the wall, so Jordan had to swoop in and help me. I am not handy. Sad face. I love seeing house projects! Maybe because I'm always looking around for some inspiration and ideas that are easy and doable. That's a great idea! I do have a lot of space so something like that might work and add some color. Thanks! I love these posts! I'm always looking for budget-friendly ways to decorate since we are never in one place for a long time. I also think you have serious decorating skills. I like the idea of hanging a photograph/picture above it! Also, big yes to a picture! If my vote counts for anything...ha! I would put something tall on the top shelf (vase with greens?) or hang something above the shelf. I love pics like these! They're helpful for when I have similar problems or projects I'd like to tackle. Yes, I think a picture above the shelf would look nice. Or maybe a clock? I'm always wondering what time it is when I'm in the bathroom and wish I had a clock in my own. That is a great ide! I am always wondering what time it is when I'm in the bathroom. ohhhhhh i love that shelf!!! i'm all about small updates! If you want an extra little something above... just get one of those cute thin horizontal signs with a cute saying or verse. I like it! I never used to think about adding shelves when storage was limited. Like somehow if it wasn't already there, there was no way I could add it. Which is silly. We can always use the extra bathroom storage. I agree with Mindy, maybe a nice print with a quote or pic above it. I am sooo with you on bathrooms! And actually....As long as there is plenty of storage and an open floor plan, I'm finding that less space is more in the entire house. Maybe I'll change my mind one day, but for now, that's my story. 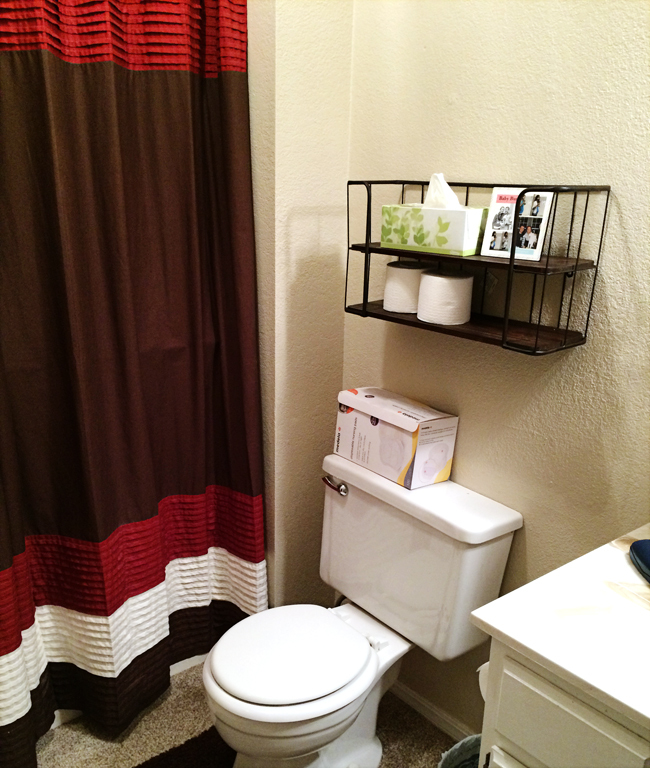 I LOVE your shower curtain and I like the simplicity of that shelf too!!! It's perfect for what you had in mind and it fits right in. I THINK I'd hang a picture above it. But, maybe not. I don't really have an eye for those things either. I just go with what I like and if I get tired of it, I change it. I'm ALLLL for you sharing these kinds of projects! I like the projects you share. It's fun to see. What if you put a verse or a fun quote above it? I'm sure you could create one or print one and then buy a frame and it would be cost efficient. Keep the projects coming! I love seeing things I probably would have never thought of...especially from you, because I know I won't get all excited about it just in time to find out your new shelf costs $800 to DIY. i love little projects, share away! our master bathroom is about the same size, if not smaller. no tub. we have a tub in the other bathroom because i LOVE baths, i'm seriously like a child. i take one every night as part of my bedtime routine. no bottle though. haha. Cute! I love home projects so I definitely vote you continue to share! I like it! Simple and useful! I think a picture or canvas or even two small pictures on an angle above it would look nice!